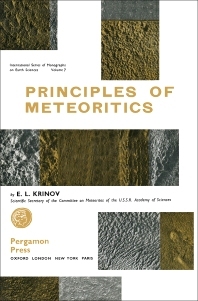 Principles of Meteoritics examines the significance of meteorites in relation to cosmogony and to the origin of the planetary system. The book discusses the science of meteoritics and the sources of meteorites. Scientists study the morphology of meteorites to determine their motion in the atmosphere. The scope of such study includes all forms of meteorites, the circumstances of their fall to earth, their motion in the atmosphere, and their orbits in space. Meteoric bodies vary in sizes; in calculating their motion in interplanetary space, astronomers apply the laws of Kepler. In the region of retardation, the direction of motion of the meteoric body changes, and a break in the visible and real trajectories follows. The angle of fall of meteorites at a vertical line on the surface of the Earth measures between 20 degrees to 30 degrees. The text also discusses the Tunguska and Sikhote-alin meteorites, two gigantic meteorites that fell in the U.S.S.R. The text also discusses the chemistry, the mineralogy, the petrography, and the physical properties of meteorites. The book is suitable for astronomers, geologists, and general readers who have an interest in sky watching.